Participating in student organizations is a valuable way to make connections and develop professionally. Potential employers often want to know that you took an active role in your field as a student. The Herbert School of Communication invites you to participate in our community by becoming involved in one or more of the organizations described below. For more information, you should contact a faculty adviser. One look at the clubs described here shows how diverse our student organizations are. But we can grow, too. If you don't see an organization that meets your needs or interests, you can find other students who share those interests and start your own organization. Each organization on this list was created by someone like you, someone who wanted to get together with those who shared social, intellectual, and professional interests. We hope that you will find student activities to be a vital part of your Hofstra experience. Hofstra’s Pride Productions video production unit worked shoulder-to-shoulder with journalists and networks covering the first presidential debate at Hofstra University. Hofstra Entertainment Access Television network is the School of Communication's student-operated college television production organization. Open to all students on campus, HEATnetwork produces original television programming, as well as entertainment and informational programming. All HEATnetwork student-produced shows allow their student participants to showcase their talents and achieve personal growth. The extent of participation is dependent on prior knowledge and experience, and there are numerous staff and production positions available for television enthusiasts of all levels. Her Campus is the leading online magazine for college women written entirely by the world’s top college journalists. With more than 4,000 contributors and counting, Her Campus has content sharing arrangements with HuffPost, Self, USA Today, and Seventeen. Writers for the Hofstra University chapter have gone onto successful careers in dozens of major consumer magazines. Hofstra Filmmakers' Club is the Herbert School of Communication's student-operated college film production club. The Hofstra Filmmakers' Club submits original films to different festivals to showcase their talents. Membership is open to all students who are genuinely interested in film production. The Chronicle - Hofstra University's weekly newspaper which covers both global and university-wide sports, news, and entertainment. Hofstra Critics is dedicated to creating a safe environment for critical analysis. We believe that everyone is a critic and any member will be given the opportunity to voice their opinions in group discussion and even through published reviews (like the ones featured on this website). Lambda Pi Eta is the official honor society of the National Communication Association (NCA). The goals of Lambda Pi Eta are to recognize, foster, and reward outstanding scholastic achievement; stimulate interest in the field of communication; promote and encourage professional development among communication majors; provide an opportunity for discussion and the exchange of ideas; establish and maintain close relationships and understanding between faculty and students; and explore options for further graduate studies. For further information, please refer to the bulletin. The Long Island Report is a multi-media news organization run entirely by Hofstra University students. 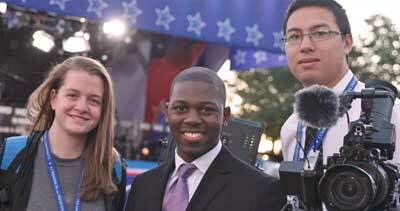 Students gain valuable real-world experience producing news and features for the web. Students learn how to work with text, images, video, audio, flash objects, html and social media as they create this multi-media content. The chapter serves its members by enhancing their knowledge of public relations and providing access to professional development opportunities, and to serve the public relations professional by helping to develop highly qualified, well prepared professionals. It is open to all PR majors and those who are seriously considering making PR their major. Hofstra University Pride Productions produces live online broadcasts of select Hofstra events, including NCAA Division I athletics. The purpose of this chapter of React to Film is to inspire young people to engage in the real issues of today through film. As a part of React to Film’s greater College Action Network, our goal is to use the best of today’s documentary filmmaking to promote social responsibility and civic engagement. Required Radio is an alternative 24/7 music and arts internet radio station created by the Radio Program at The Lawrence Herbert School of Communications at Hofstra University. The chapter's purpose is to bring students, faculty and professionals together to discuss issues facing journalism today. Additionally, we hope to polish writing, reporting, and broadcast skills. The student SPJ chapter is a subsection of the Long Island Press Club, the professional organization of journalists living or working on Long Island. The two groups work together closely on various journalistic projects and social events. The Hofstra chapter regularly sponsors career conferences, discussion groups, and field trips, all on the cutting edge of journalism. Hofstra University broadcasts to Long Island and parts of New York City at 88.7 FM, and webcasts to the world at www.wrhu.org. The station is on the air 24 hours a day, 365 days a year, and reaches a target audience of almost four million people. With an operating staff of more than 100 people, WRHU is primarily student-operated. As a cornerstone of the School, WRHU exists to provide quality broadcast training to qualified Hofstra University students. Participation at WRHU is recommended as one of the most effective methods of learning the business of radio broadcasting and audio production while engaging in a practicum that  complements academic classroom learning. Interested students must apply, interview, and be placed into a 10-week, noncredit training class held twice per year. For more information, visit www.wrhu.org. Zeta Phi Eta at Hofstra University is the Beta Eta chapter and was founded in 2013. We thrive on making strides as an organization both personally and professionally and all of our members are involved in the communications field.